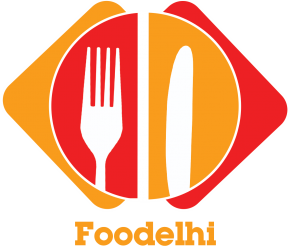 Authentic food always catches the fancy of the connoisseurs and foodies of the city alike. 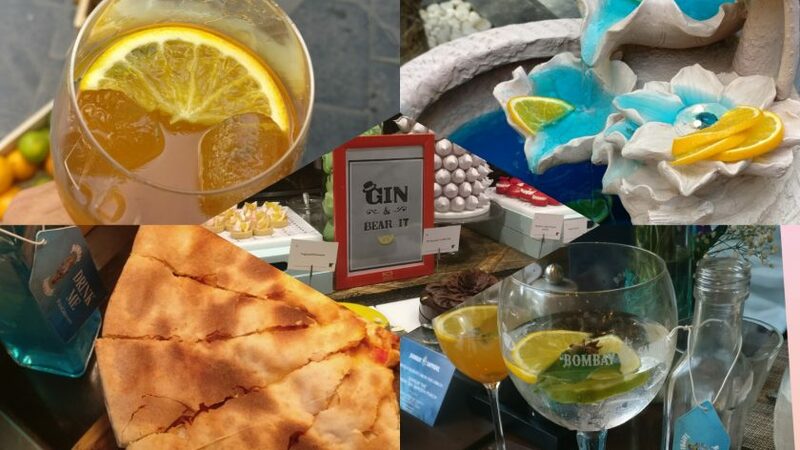 When that authenticity comes from the fact that the food is prepared by a native of a particular region of origin of the cuisine, the experience is definitely enhanced many folds. For that reason, the newly opened restaurant Baris in GK-2, Serving Turkish cuisine in Delhi has been able to impress my taste buds. 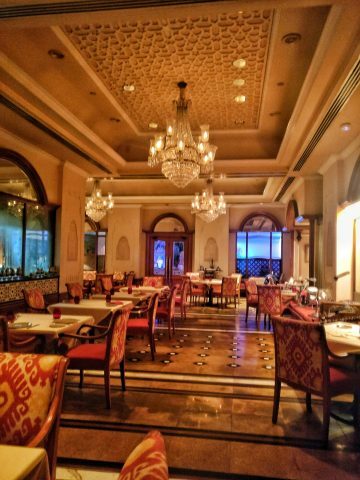 Baris introduces us to the Turkish food in Delhi in its authentic avatar, under the culinary leadership of the Executive Chef Sahin Ibis who hails all the way from Istanbul. Hence, there are no questions that could be raised about the authenticity of the cuisine served at this beautiful fine-diner. I call it beautiful because of the fact that the interiors are nothing less than royal. The dim-lit chandeliers and the lamps make for a setting that would trick any visitor into thinking that they’re actually dining at a restaurant in Turkey itself. 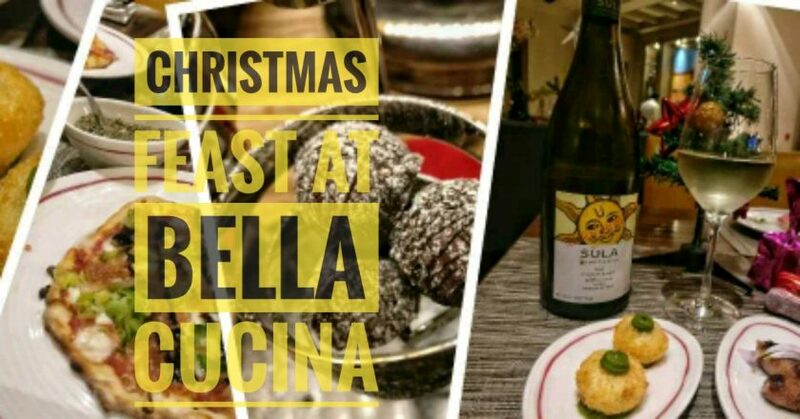 The menu may confuse those who aren’t well-versed with the cuisine (this is where you would need to take the assistance of the servers and the descriptions given below the dish names). The staff is indeed well trained to guide you well with the delights to order. Lamb is the basic meat staple for the Turkish cuisine. For that reason, the menu is well-endowed with ample of Lamb dishes. This doesn’t mean that there is a dearth of vegetarian options in the menu (after all, the increasing population of people choosing to give up meat can not be ignored). 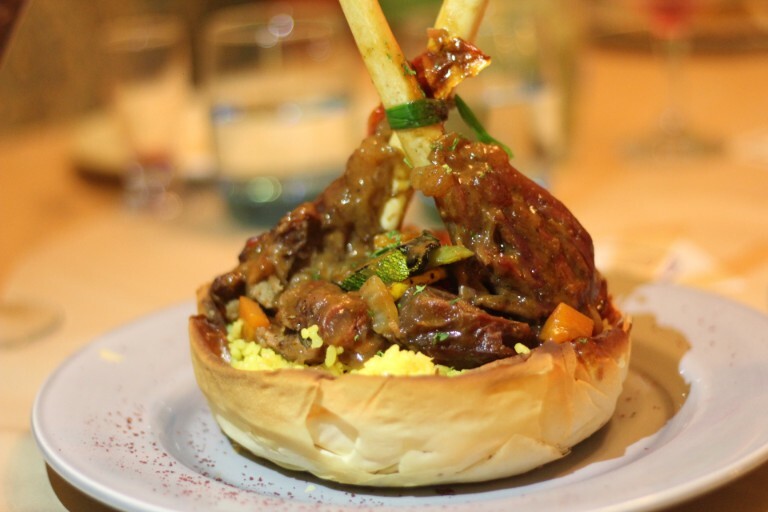 Kuzu Iznik: Served in a crispy flaky pastry dish with a side of aromatic rice, the meaty Lamb shanks were full of subtle yet lingering flavors. An out & out treat for the taste buds. 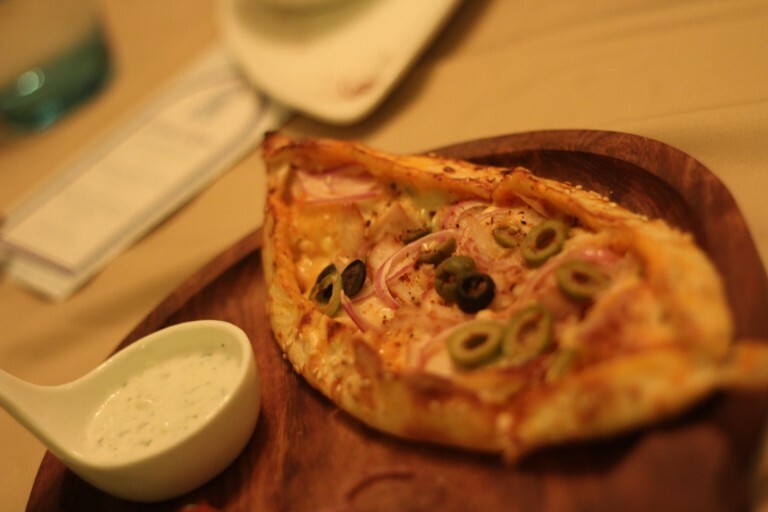 Dumanlamnish Tavuk Turkish Pizza: The super crispy boat-shaped pizza is high on taste while not being overly cheesy, topped with simplistic toppings like Smoked Chicken, olives, basil, and onions. A Delicious take on the Pizza as we know it. Served with a curd based Tahini Sauce. Loved every bite of this one. Shish Tawook: Succulent skewers of chicken roasted with an array of lingering Medditerrian spices (and Onion pepper), served with a Thin Roomali Roti Roll. 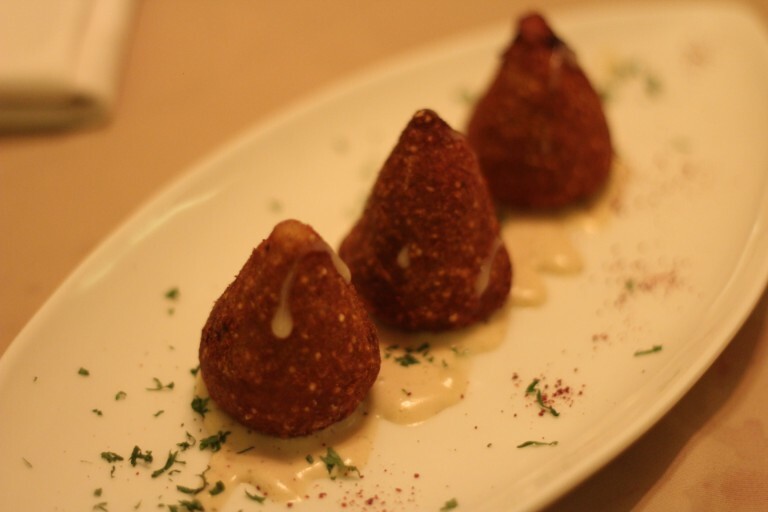 Lamb Kibbeh: Good looking Pyramids of Bulgar patties filled with lamb mince, onions, pine nuts (according to the menu), served with the Tahini (without it, the Kibbeh is too dry for the palate). All in all, I wasn’t too impressed with this particular dish (also, Pine Nuts weren’t used generously). 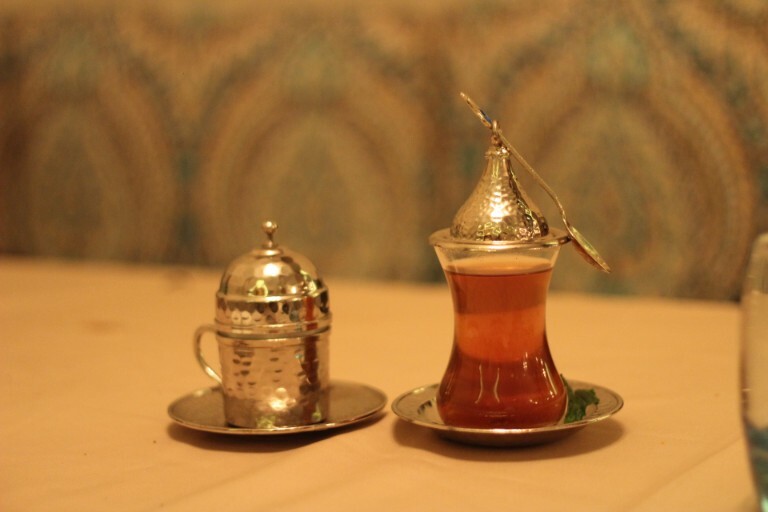 To take a break from the hearty Turkish meal, you can definitely order some aromatic and deliciously strong Turkish Coffee (served like it would be served to an Emperor). When we talk Turkey, how can we not talk about Baklava? Well, of course, this dish had to be ordered at Baris. Was I disappointed? No, I was rather impressed with the fine quality of Baklava. 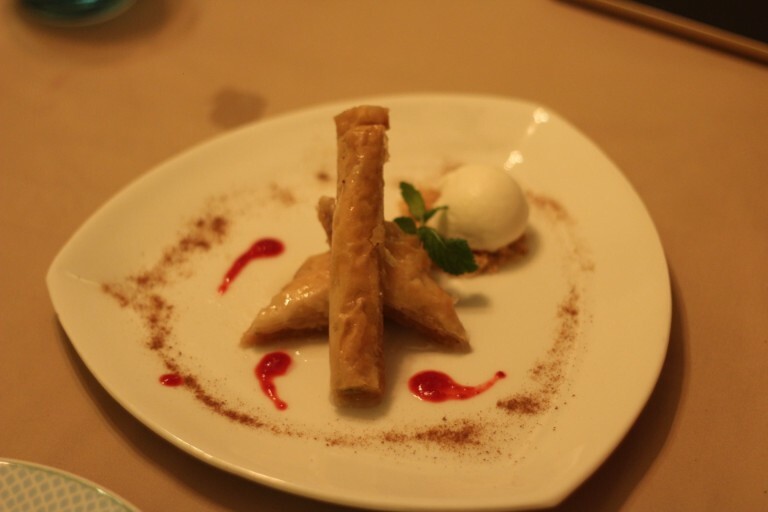 How to judge a Baklava? Just take a bite and taste the sweetness of it while searching for the flavor of pistachio. For me, a great Baklava is always the one that might be a bit too sweet but at the same time has a generous use of Pistachios. On all these parameters, the Baklava at Baris was certainly the best ones I had tasted in Delhi. Yes, Baris GK-2 is definitely worth a try for its generous use of exotic ingredients, the sophistication of the place itself and of course, an authentic Turkish dining experience created by Chef Shahin Ibis himself.